The play is seeing something of a resurgence lately, after years of not being performed very much. 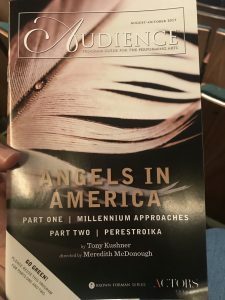 It’s a fairly long theatrical experience, two full-length plays (if both are produced, sometimes theatre only do Part 1, “Millennium Approaches), lots of scene changes, a complex wiring setup required for the Angel character, etc. But, as the play has reached its 25th anniversary, and with the advent of Donald Trump to the US Presidency, Angels seems to have renewed vigor. The production was great–I loved the creative staging and particularly the presentation of the Angel (Rami Margron). I haven’t seen any other productions of “Perestroika,” so I cannot speak to how the wires which hold the Angel are generally done, but this production used the wires as a complement to the character’s emotional state. When the Angel felt deflated, the wires lowered her, droopily. When she was sassy, the wires turned her slightly, and back again. It was a great use of stage tech to complement a performance. The cast was, generally speaking, fantastic. It was notable to me that both Louis (Richard Gallagher) and Joe (Brian Slaten) came across as much more sympathetic than the way I typically read them. Louis is meant to be something of a jerk, a would-be intellectual who is some ways is the living embodiment of the “well, actually” type of guy. He is forever making excuses for his behavior and trying to talk himself out of the stupider things he says, but is above all else, the man who abandoned his sick boyfriend who is facing AIDS. Yet Gallagher developed Louis into a kind of pathetic hipster who seems more confused and uncertain of himself than, say, Ben Shenkman’s portrayal in the HBO film. Likewise, Joe is typically an awful character, a closeted gay man rejecting and abandoning his mentally ill wife, clinging to his Republican beliefs, and even seeking validation from his mentor, Roy Cohn (the “polestar of evil”). Joe is not, to say the least, sympathetic. But in the hands of Slaten, Joe is more conflicted and convicted by his failures. I think the choice to have him completely remove his clothes in one scene helped solidify this sympathy, as he is the only character who ever gets naked (and he gets NAKED), and that literal and figurative vulnerability registered as very sympathetic with me. If the production had any faults, it was in the pacing, which at times seemed quite rushed. “Perestroika” is a rather long play, and this production clocked in at nearly 3.5 hours. In an interview contained in the program, the director Meredith McDonough acknowledges that a major concern with staging the play is “getting everything on and off stage quickly and efficiently. God forbid, you are adding time with scene transitions or drawing the audience’s focus out of the story. I can understand this concern, and with such a long running time, efficiency is key. But the pace of transitioning scenes seemed to affect some of the performances: Roy Cohn (Lou Liberatore) was practically spitting out his lines in the early scenes, going so quickly he tripped up on his dialogue a few times. The pace settled down a bit as the play progressed, but it was clearly a challenge to time things just so. Given these constraints, the actors and crew handled things pretty well, I think. I also found myself crying at the end, even though I had sworn myself to dry eyes. The epilogue always gets me, whether I am reading it, watching the HBO film, or apparently, watching it in an audience. When Prior says “we will be citizens,” I always find that to be a poignant moment. And though I tried to stop it, the water works turned on. So the cast no doubt saw one sobbing woman amongst everyone else giving them a standing ovation, even though I tried so hard not to! But the play has such resonance in our current era, that I am sure it touched the rest of the audience deeply, as well. So, go see this production! Part 1 runs until October 10, and Part 2 until October 14! This entry was posted in Pop Culture, Teaching, Theatre and tagged Actors Theatre, Angels in America, Roy Cohn, theatre, Tony Kushner. Bookmark the permalink.